It’s been far too long since I’ve posted, and the last month has had it’s ups and downs. 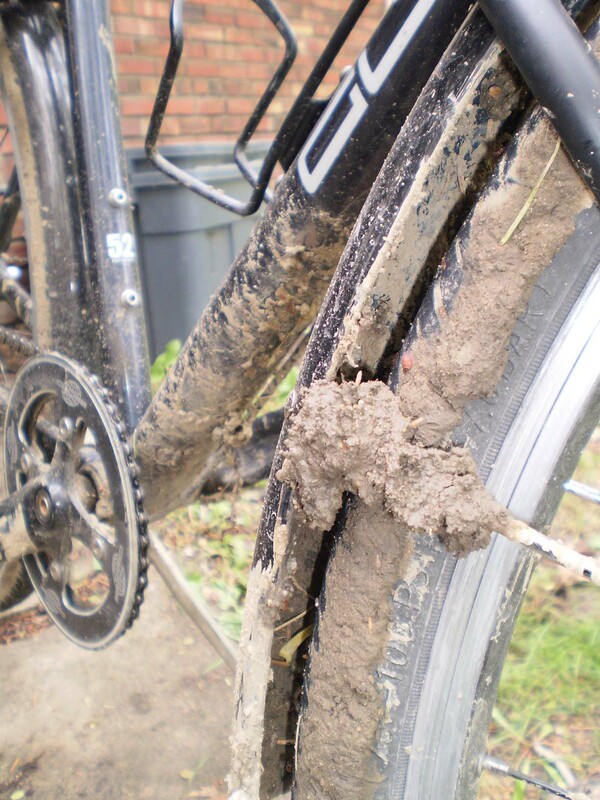 On the downside, I got this nasty, lung-clogging flu that kept me off my bike for the longest period of time since 2005. On the upside, I’ve built up my newest winter bike and am enjoying a little bout of newbike-itis. Introducing the Romein Fashion 90210. The distinctive down tube/seat tube connection seems to be a hallmark of Romein bicycles. This not so little dutch bike came into my life last fall sporting a back wheel with a cracked rim and a half dozen broken spokes and front wheel that wasn’t much better. 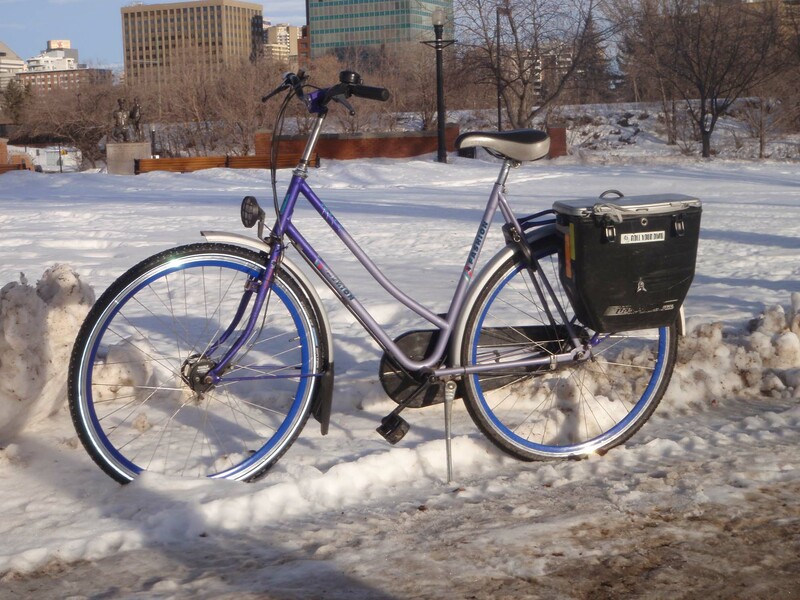 But it also came with a 3 speed Sturmey Archer hub, drum brakes, full fenders & mudflaps, a skirt guard, a fully encased chain, matching rack, cafe lock, rack straps, and a super solid kickstand. 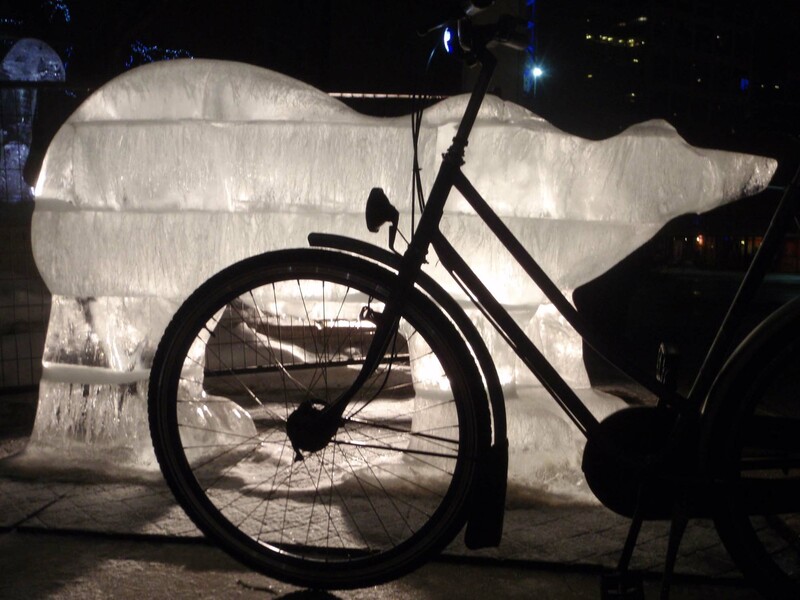 It was exactly one generator (it even has the lights) short of being the perfect winter ride. But there’s also a bit of mystery surrounding it. This Romein, with it’s two-tone purple paint job was far brighter than your classic dutch bike, and it’s moniker, colour scheme and mountain bike-ish influences placed its birth square in the nineties. It’s Fashion! 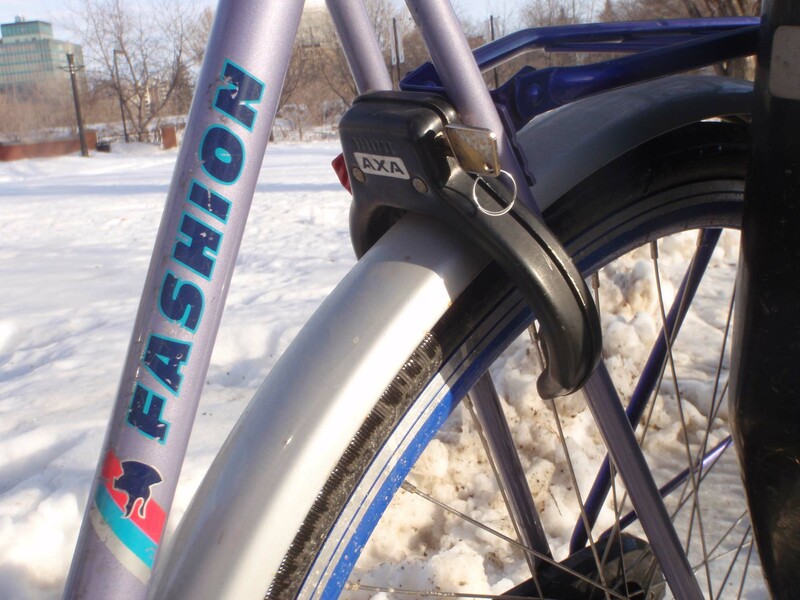 Also, check the cafe lock and matching purple rack. I took off the skirt guard to repair it. I don’t think anyone in Beverly Hills in the 90’s would be caught dead on a dutch bike. I decided that since the bike needed new rims anyway, that I would lace up those Sturmey Archer hubs to bright blue deep-V rims. Why? Because I can. Coloured rims, being the fashionable choice, would not only update the bike, they’d make it a bit of a show stopper. 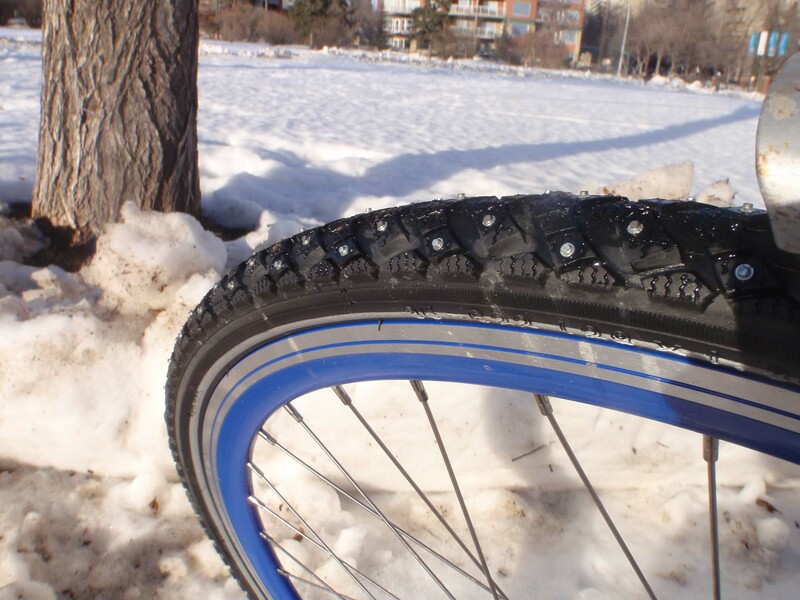 Fresh studded tire on the new blue rim. The early nineties Sturmey Archer hubs, (plastic) shifter and (plastic) brake levers aren’t exactly a classic vintage, however. If I can, I’ll probably replace them with older school metal components. 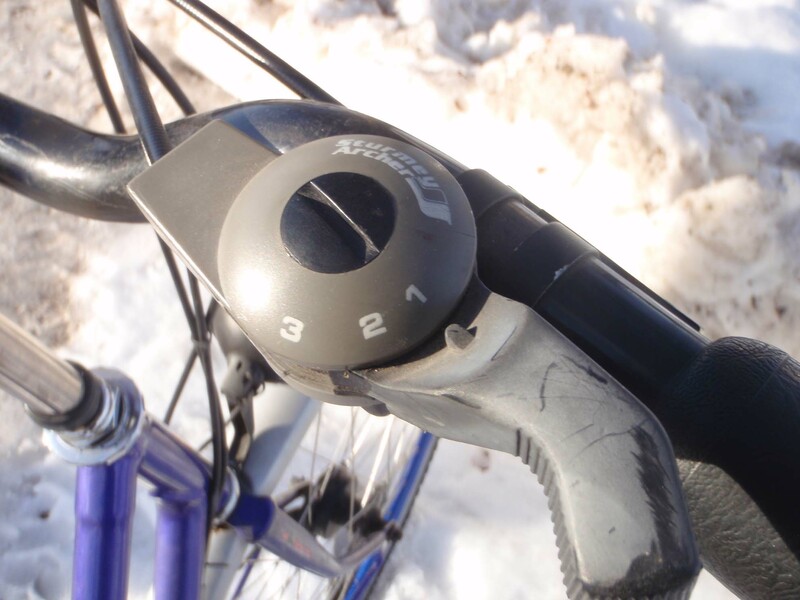 There’s a lot of plastic on the brake levers and shifters. I hope it will stand up to the cold. The chain case is also plastic and doesn’t seem very robust so I’m expecting to have to remove it sooner or later. Overall, it seems like it started out life as a low-end bike even though it has features that are either hard to find or only available on a higher end bike in North America. 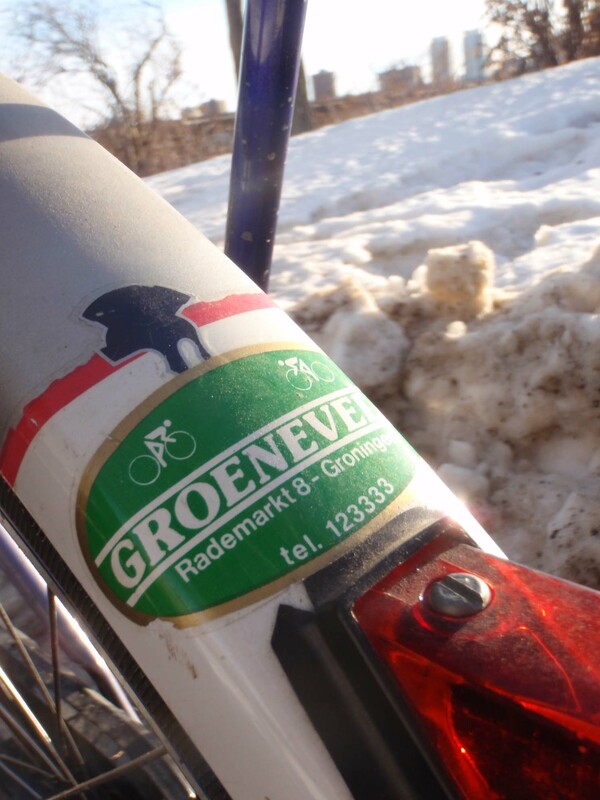 A dealer sticker from Groningen in the Netherlands. What an age we live in that I can, with a few keystrokes, go to a Google street view and find a picture of a street half way across the world where this bike was first purchased. It’s a quaint, narrow street in the city of Groningen where there’s bicycles a plenty, but no bike shop. Groningen has been called the “World Cycling City” because 57% of all trips are made by bike (Wikipedia). Sounds cool. Speaking of cool, the Dutchy’s getting a taste of winter with an ice bear. I still haven’t been able to find out much about the manufacturer/brand name Romein, save a couple of photos of bikes older than mine. 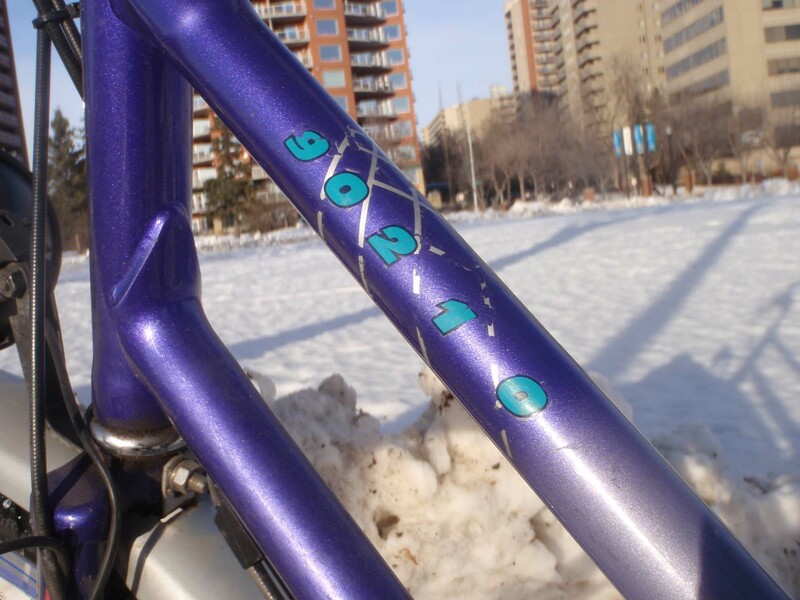 If anyone out the has any info on these bikes, I’d love to hear about it! This bike looks sweet with any colour. Fashion is best when you play around with it and switch things up. Cyclists constantly hear complaints from drivers about how difficult we are to see (or more accurately, how easy it is not to see us). 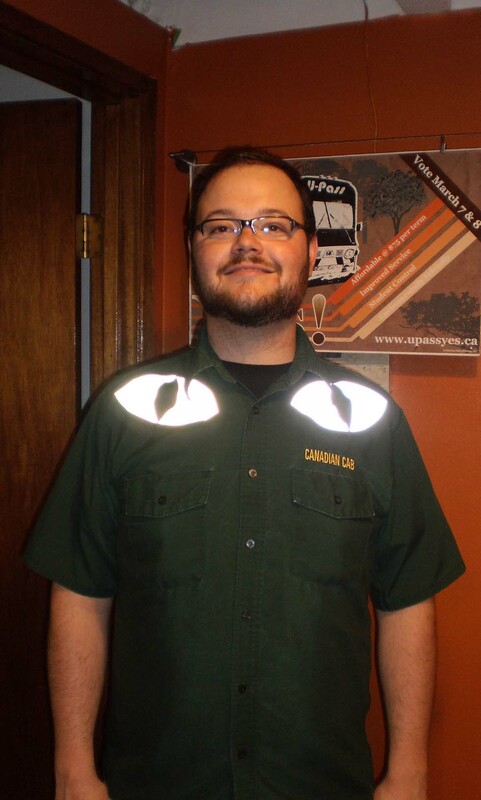 In response, some cyclists will feed an endless supply of batteries to a Xmas tree’s worth of blinkies while others repurpose dayglo highway worker vests into everyday riding garb. And that’s fine, it’s just not the way I roll. My hoodie with a retroreflective owl in a tree and stars, plus a floral design on my calf. Being seen doesn't mean having to wear stripes. Photo by Chris Chan. 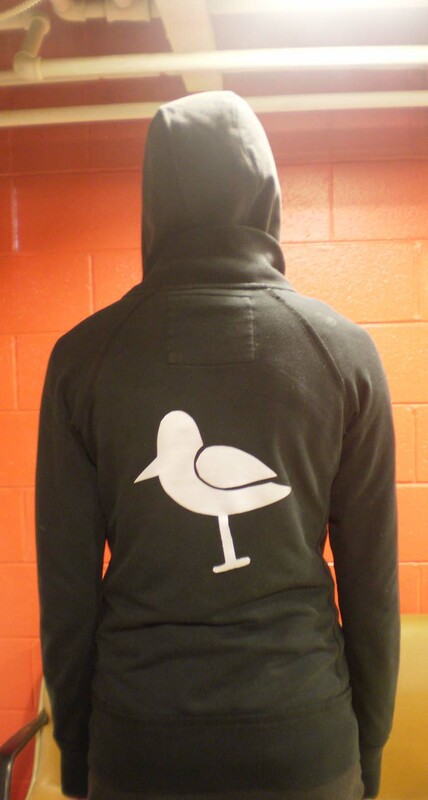 Geneva put a little bird on her hoodie. The retroreflective silver returns the flash right back to the camera. 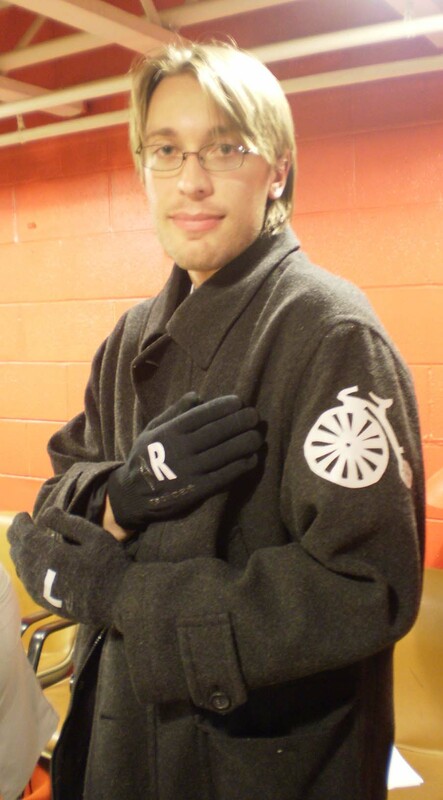 When I ride, I hope to encourage other folks to ride, too, and I think that presenting bicycle commuting as something you need an ugly uniform to do safely is contrary to that goal. 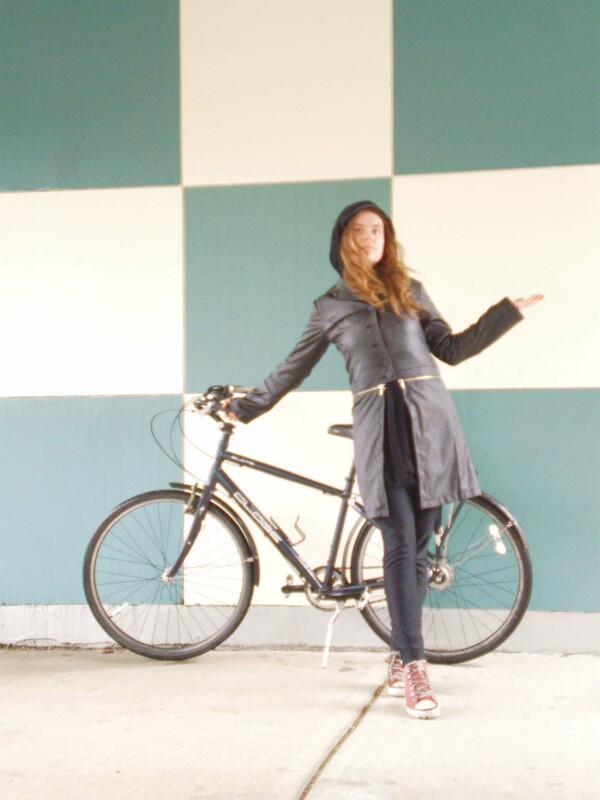 “Cycling clothes” need not be discernible from street clothes, they’re just street clothes that happen to be suitable for cycling (which includes everything but the trench coat). 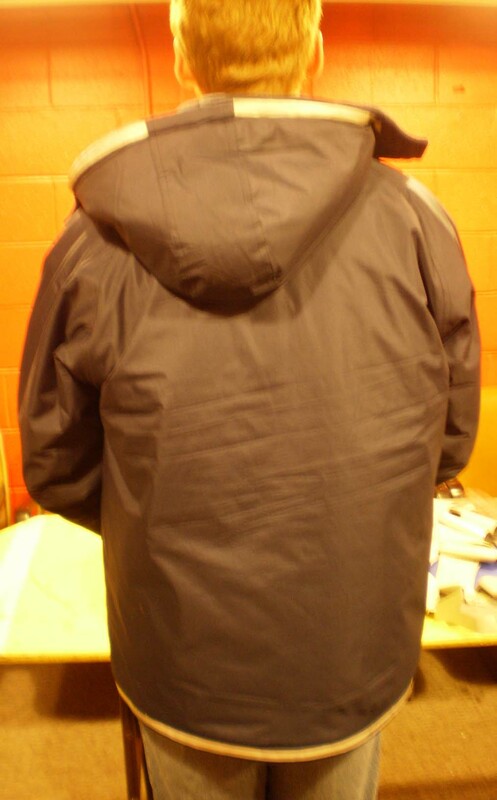 Haydn put some subtle stripes on his parka. Under headlights, though, not so subtle. 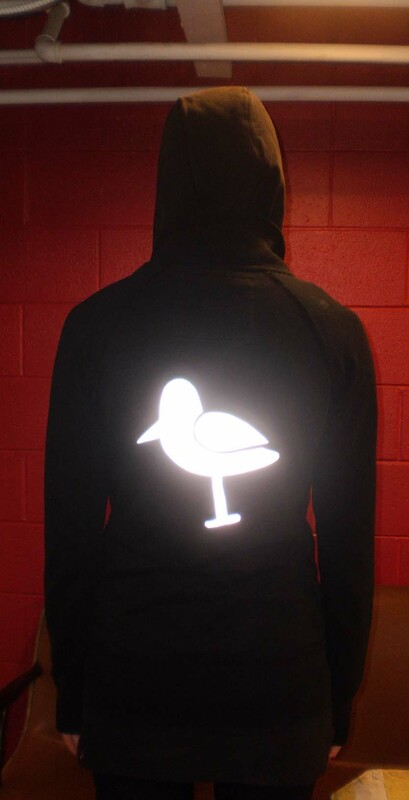 Still, some of the technology being developed for safety and athletic applications, such as retroreflective treatments are pretty cool, and I am very interested in applying it to apparel without it reading as safety wear. 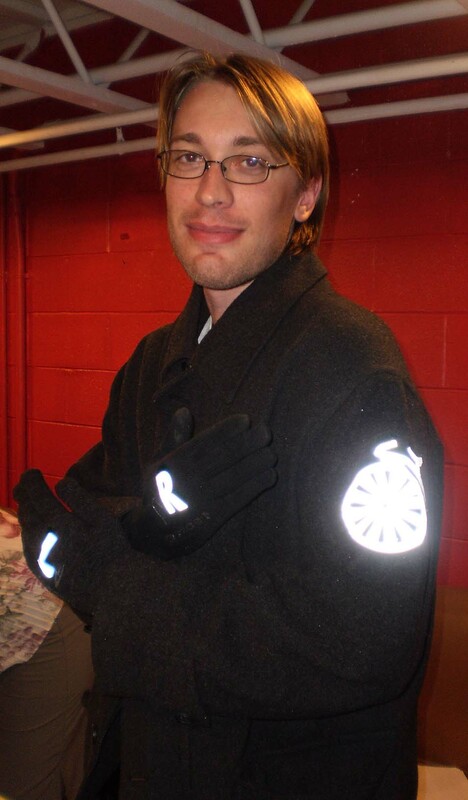 ... Ian also created a turn signal effect on his gloves. Perhaps I should begin with what retroreflective is, besides a cumbersome word that spell check won’t recognize. A retroreflective surface reflects light back to the source, no matter what angle the light hits the material. This is important for cyclists because at night it reflects the light from car headlights back to the driver, often allowing them to see a cyclist earlier than without a retroreflective sumtin sumtin. It’s no substitute for a good set of lights, but every little bit can help. In the photos throughout this post, the camera flash simulates the effect of headlights. 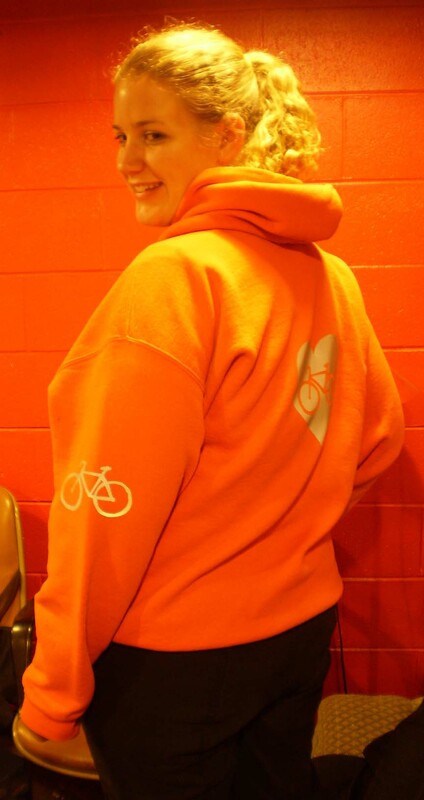 Orange is good color for daytime visibility. 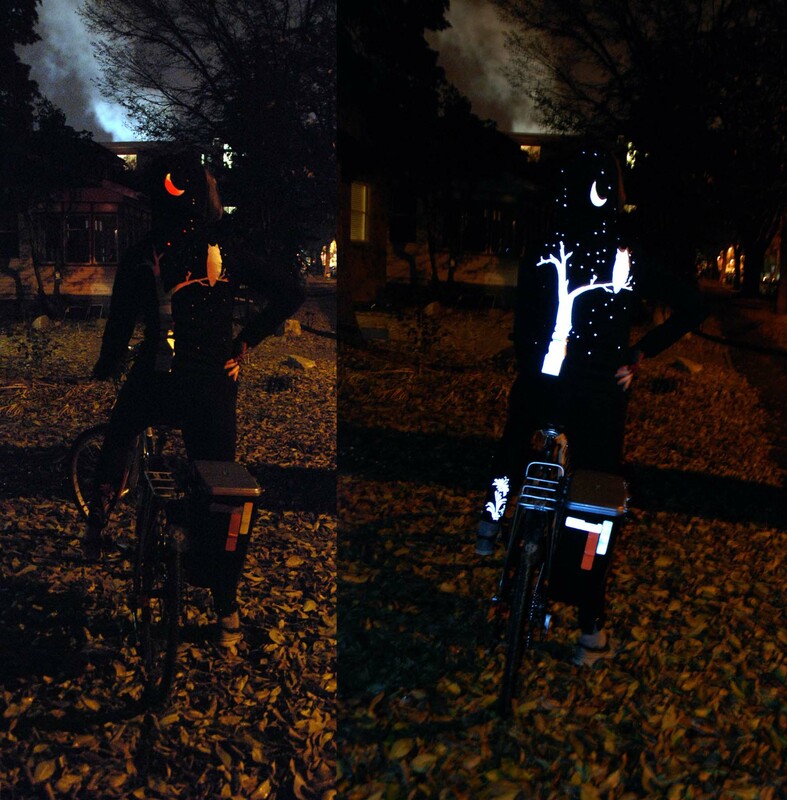 With the addition of some retroreflective motifs, it's a good choice for night riding, too. 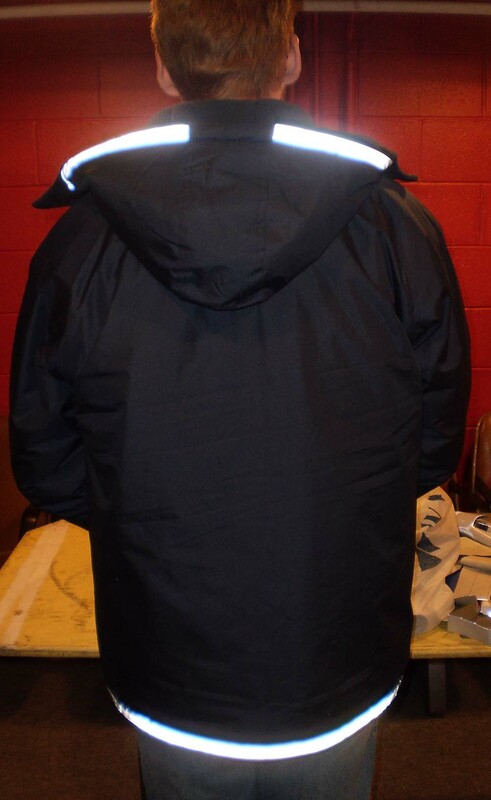 Over the last year or two, I’ve facilitated several workshops for folks to add retroreflective accents to their own clothes. The material we use is scrap from industrial production, the process is pretty simple, and the imagination is the only limit. All the pictures you see in this blog post taken in the red room (the upstairs lounge at EBC) are of folks who spent an evening with me brightening their wardrobes with this silver film. Brendan's strategy for choosing his motif was one of my favorite. "Eyes" like a moth to activate the "flight" response in the most primitive parts of the human brain. This week I’m holding another workshop (Thursday, 7pm at EBC – register by emailing courses (at) edmontonbikes (dot) ca ) for anyone who’d like to increase their visibility without increasing their geekiness (unless you want to up the geek factor, and I’d be glad to help you if that’s your steez). 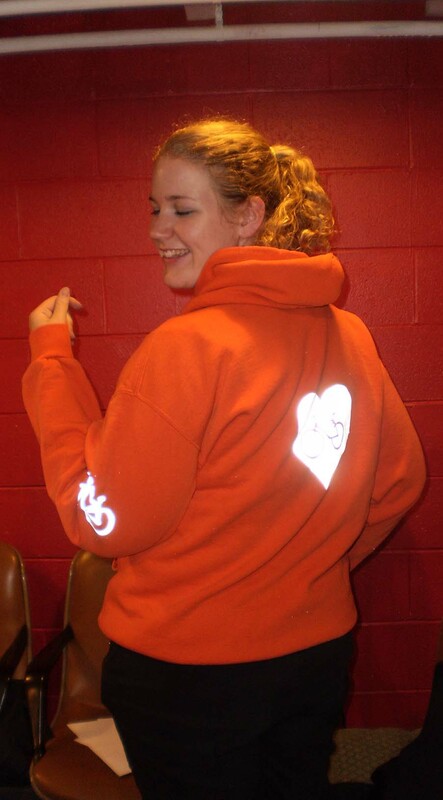 As well as using the retroreflective silver film for clothing, this workshop will have another exciting aspect (hey, I get excited by stuff like this). Inspired by a really cool tutorial on Giver’s Log, I’ve got my paws on some raw, traffic grade, tiny retroreflective glass spheres – think of it as high visibility glitter. 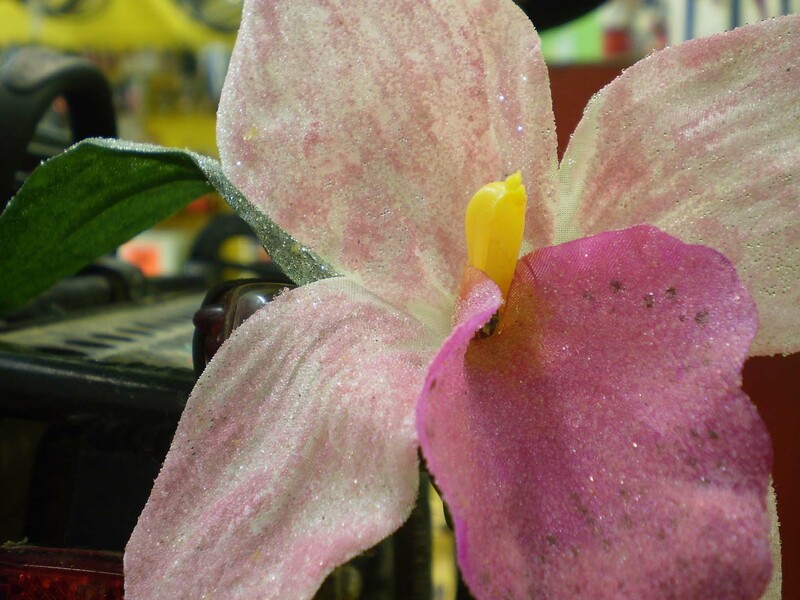 The retroreflective glass beads I added to this orchid for my bike look like a layer of sugar. 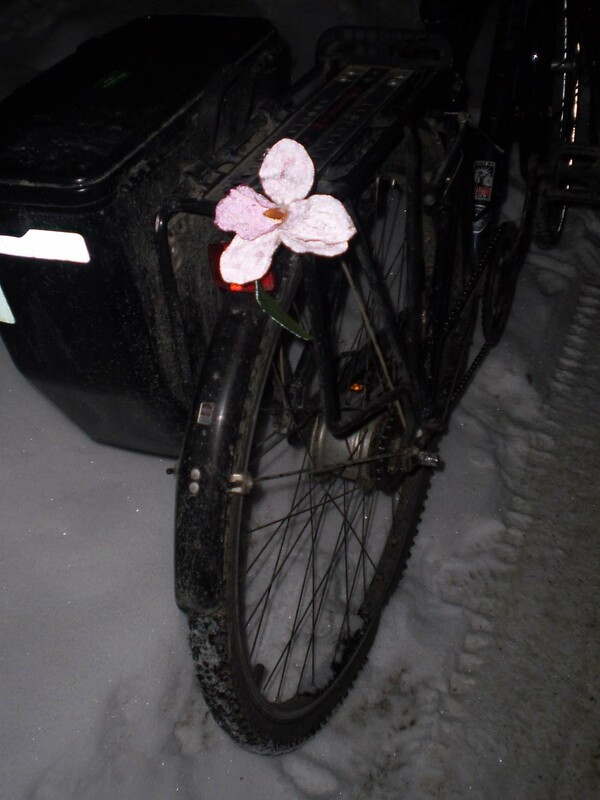 Outside, in the dark, this lovely orchid sends more light back to its source than the red rear reflector. Having access to the raw material means we can now retroreflectivize a greater variety of stuff (specifically, anything that can be painted with acrylic craft paint) in almost any color. 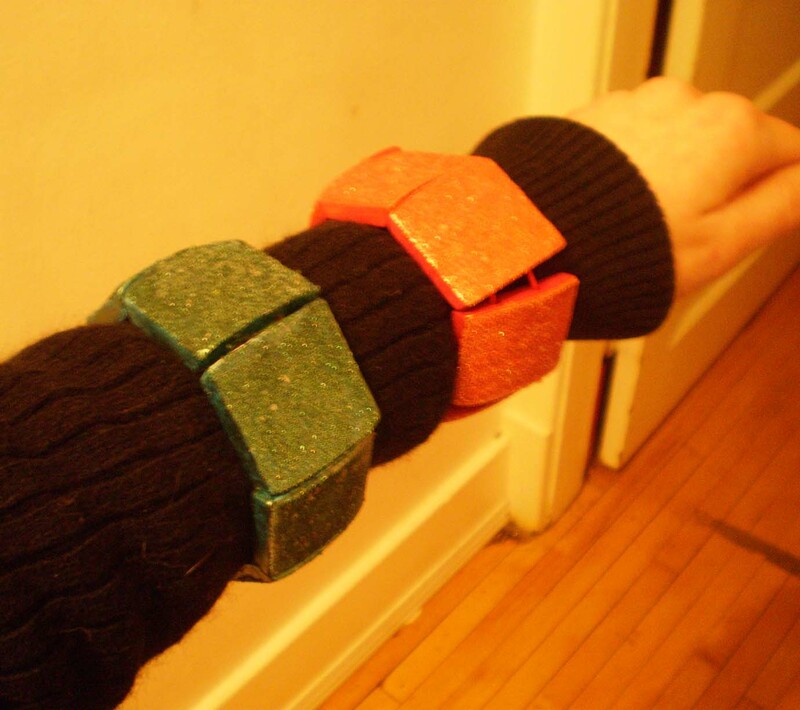 These bracelets don't look like safety wear. 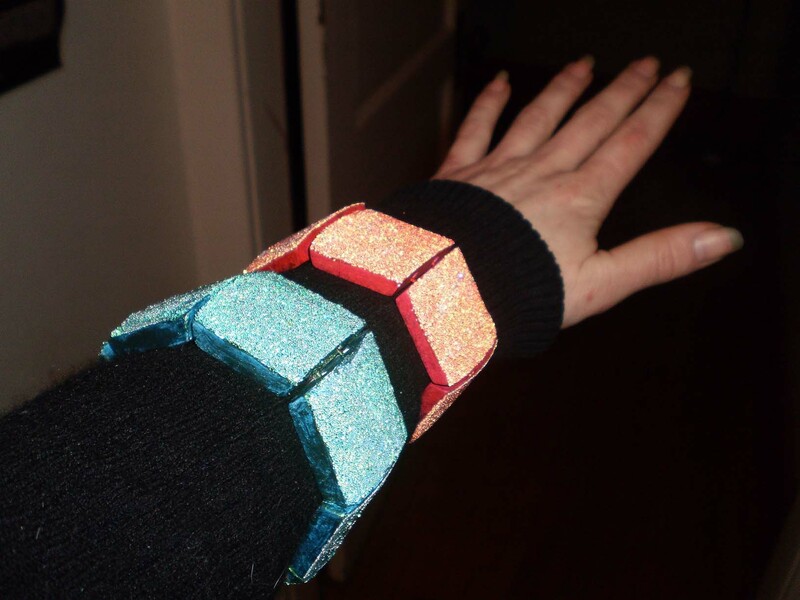 But in headlights no one will miss a turn signal when you're wearing safety bling. I’ve barely begun exploring the possibilities of this stuff, and I’m really looking forward to seeing what the workshop participants will create on Thursday. If you’re in E-town this week, come check it out! The workshop will be fun, it’s cheap and there’s still space left for last minute registrants. 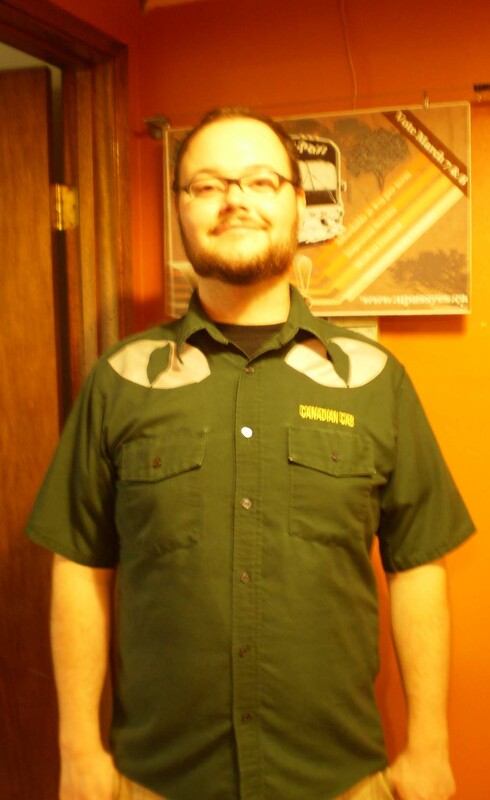 It's the one day of year green corduroy is THE thing to wear. 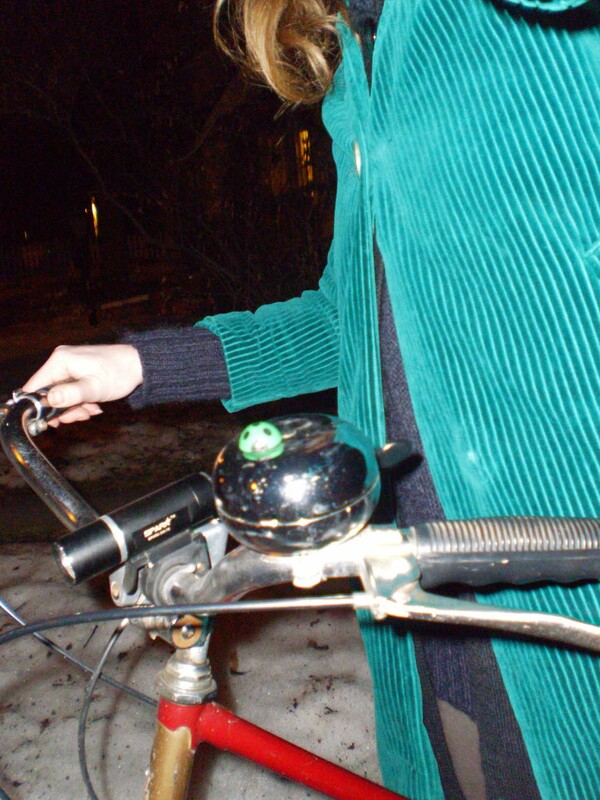 I have an emerald corduroy jacket that’s is just a little bit too light to wear on it’s own on that mid March green wearing kind of pseudo holiday, except it was so unseasonably warm today I wore it. It would have worked out well if I didn’t have to work late and ride home after dark, brrrr. Plus, one of Marjory’s cable stays took a bite out of my tights, so it’s been a fashion fail day all around. Even though every pair of pants I own have a hole in the inner right cuff, it’s been a long time since I’ve had a clothing/bike malfunction. Marjory's also sporting a touch of green. This little magnetic character has been tagging along on adventures since a friend stuck him to my bike (ah, steel frames) last year. I call him “Ding Thunk” after an incident last summer when I rode through some really thick bush (yes, on the cruiser) and thought I lost him and broke my bell. 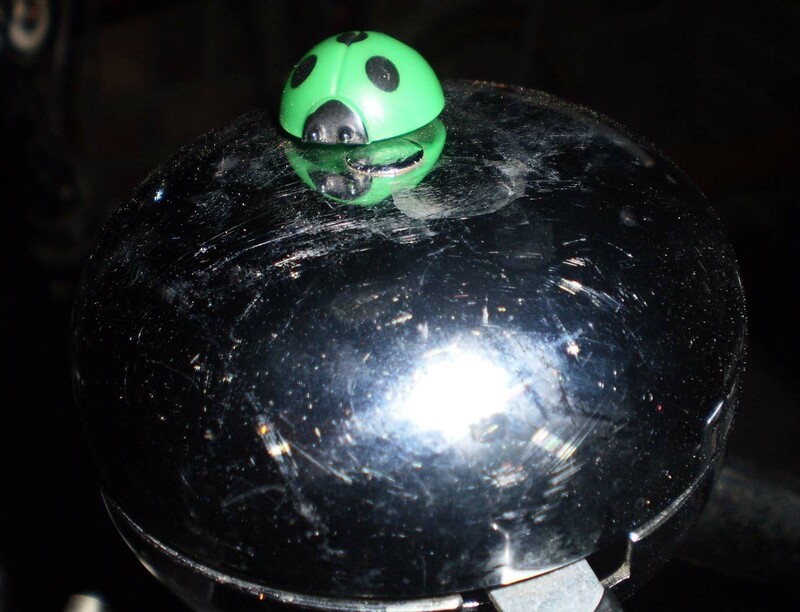 For two weeks he clung onto the bottom of the ding dong bell, completely out of sight, making the bell go “ding thunk” every time I rang it. I keep him on the center of the bell now, where he has a better view and doesn’t affect the quality of the ringing.